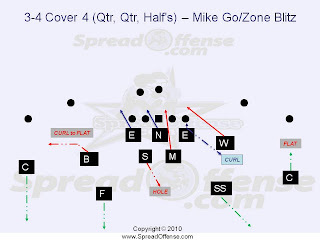 We recently posted a new article on our main site diagramming a 30 Front Zone Blitz with a Cover 4 (quarter, quarter, half's) versus a 2x2 shot gun spread offense. This is a nice scheme when the defense has the offense in a throwing situation (needing 7 yards or more for a first down). Just as you expected, Tim Tebow is doing whatever it takes to become a successful NFL quarterback, and this video shows him working to make himself better. You gotta love the 'Rambo' beard that Tebow is sporting during his re-building process... "He drew first blood, he drew first blood..."